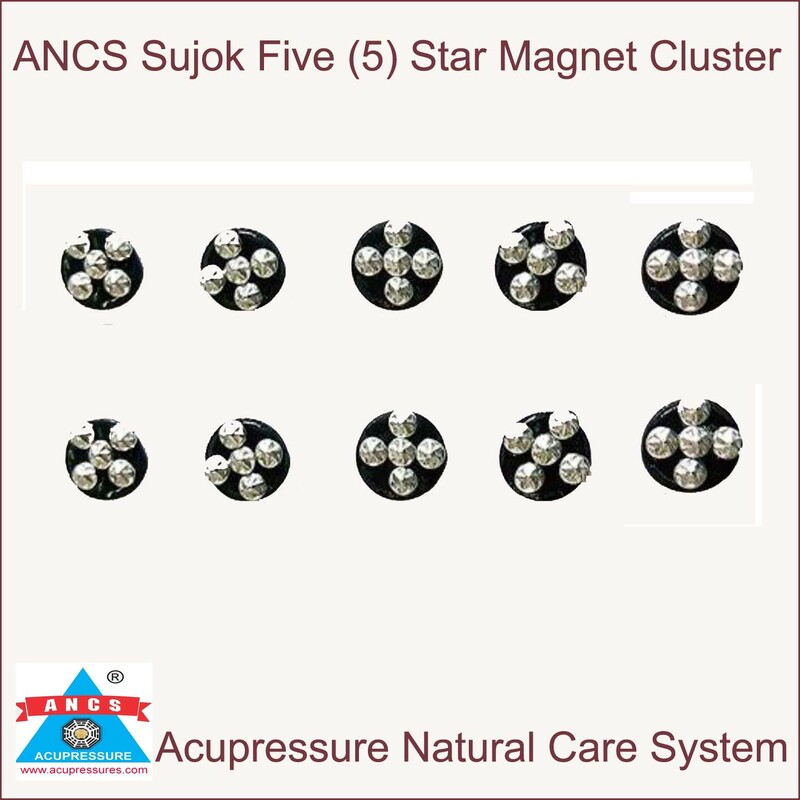 Sujok Five Star Cluster Magnet Round (Set-10) Take a look at this Brand New Five Star Magnet - Round (Set of 10). In few types of treatment, clusters of four or five star magnets need to be applied on the acu points. The therapist places one star magnet in the center of the acu point and the remaining star magnets around the central star magnet. For the convenience of therapists, pre fixed cluster of four/five star magnets glued on to a plastic surface have been designed and do away with the need for therapists to form their own clusters. Method : These magnets are fixed on the palms, fingers, feet, toes or other body parts for various duration of time as decided by the acupressure therapist. The magnets are fixed on the body parts with the help of adhesive, surgical paper tapes. Precautions : Byol and chakra magnets should be used only under the guidance/directions of a trained acupressure therapist for a specified period of time. Star magnet is relatively safe and may be used without guidance. In all cases, the magnets should be removed immediately on appearance of any adverse symptom, i.e., discomfort, heaviness, pain or numbness in head or any body part, nausea, uneasiness, sudden change in blood pressure, body temperature, etc.